(UPDATE - 12/24) Rose Bowl tickets have continued to drop significantly on the secondary market as the game approaches. The average price for the game is now $272.92, which is 60% below the average price of last season’s game. The get-in price is currently $81, which is less than half the price of the lowest face value ticket. Florida State still has some tickets available on their site. For the first time in the bowl’s history, it is not currently sold out on the primary market, leaving the Rose Bowl to have its first public onsale for tickets to the game. 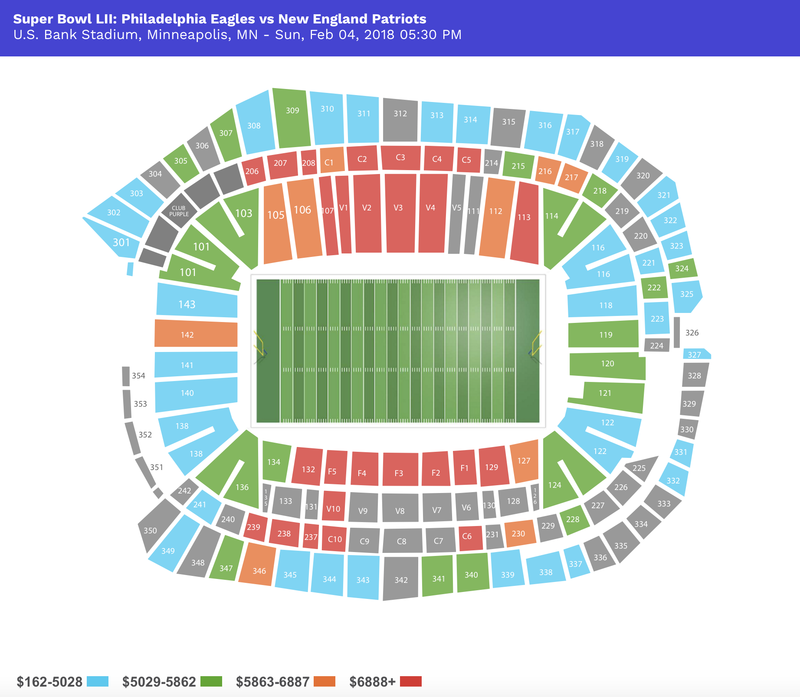 As a College Football Playoff semifinal, the low average price is a mixture of many things such as the possibility of fans also having to buy tickets to the College Football Championship Game if their school should win, and there’s travel. With Oregon over 800 miles away and Florida State in excess of 2,500 miles of travel, that’s a lot to ask of fans with a possible additional trip to Arlington looming two weeks later. Below is an infographic on the economics for all the major Bowl games that includes details on sponsorships, school payouts, player swag, and of course tickets. (UPDATE - 12/18) The Rose Bowl has long been one of the biggest games of the bowl season, but it will take an even bigger stage as a College Football Semifinal this season. The Rose Bowl will host the Nos. 2 and 3 seeds, which are Oregon and Florida State. The current average price of the Rose Bowl on the secondary market is $403.15 with a get-in price of $149, making it the second most expensive bowl game behind the Sugar Bowl. The winner of the Rose Bowl will play the winner of the Sugar Bowl between Alabama and Ohio State in the College Football Championship Game on January 12. ... (UPDATE - 12/14) The annual Rose Bowl game aka ‘The Granddaddy of Them All’ has been played annually since 1916 and is located in Pasadena, California. The Rose Bowl is a part of the College Football Playoffs and will host the meeting between the No.1 and No. 4 ranked teams in January 2015. Starting in January 2015, the Rose Bowl will be in a three-year rotation with the Sugar Bowl, Orange Bowl, Cotton Bowl, Peach Bowl, and Fiesta Bowl whereby they’ll host a semifinal game the first year and feature the Big-10 and Pac-12 conference champions. The Rose Bowl hosted the National Championship Game in 2002 and 2006. In the 2002 National Championship game, Ohio State defeated Miami-FL, 31-24. In the 2006 National Championship game, Texas famously defeated USC, 41-38. After 2007, the game was reclassified as the ‘BCS National Championship Game’. The Rose Bowl hosted the BCS National Championship game in 2010 and 2014. In the 2010 contest, Alabama defeated Texas 37-21. In the 2014 contest, Florida State defeated Auburn, 34-31. Over the last month, demand for Rose Bowl tickets has decreased. According to TicketIQ, the average ticket prices for the Rose Bowl have fallen from $501.75 to $465.52 while the get-in price has decreased from $198 to $162. Based on the current pairings, the Rose Bowl would feature a matchup between Alabama and TCU. While this may not be the most attractive matchup for a game located in California, football fans would enjoy this clash between two top defensive teams. ... The Rose Bowl this year will host one of two College Football Playoff semifinals in Pasadena, California to determine one of the two teams that will move to the final of the College Football Championship. Two teams that will play in the Rose Bowl will be announced in December based on the rankings by the CFP committee. The Rose Bowl, which will be played on New Year’s Day and will pit the No. 1 ranked team against the No. 4 ranked team. Traditionally, the Rose Bowl pits the winners of the Big Ten Championship and the Pac 12 Championship, but with the annual Rose Bowl being a College Football Playoff semifinal this year, as will be the case every three years beginning with this game, any teams may be selected to participate. The Rose Bowl is nicknamed “The Granddaddy of Them All” because it’s the oldest bowl game, which has been played since 1902 and has been played annually since 1916. Since 1945, the Rose Bowl has been the highest attended College Football Game and recently celebrated its 100th game in 2014. Currently, tickets for 101st Rose Bowl game have a current average price of $501.65 in the secondary market with a get in price of $198.